In this era of competition to stay at the edge of everything, you must be very sincere and methodical in every proceeding. In case you are getting prepared for an interview and you want yourself to see in a good company, your approach should be in a very professional way, so that the employer make sure at the beginning only that, you are the right choice and could be considered for a second meet. This article today would be discussing about suitability statement for a particular job or in general. The process of impressing starts with the preparation of a suitability statement. Now you should be wondering what a suitability statement is actually? What is a Job Suitability Statement? Also known as a personal statement, a suitability statement actually works by delineating the reasons behind why your employer should hire you? It is the reasons why your skill sets and knowledge is best suited and appropriate to the desired profile of your employer company and the job position which you are willing to attempt. 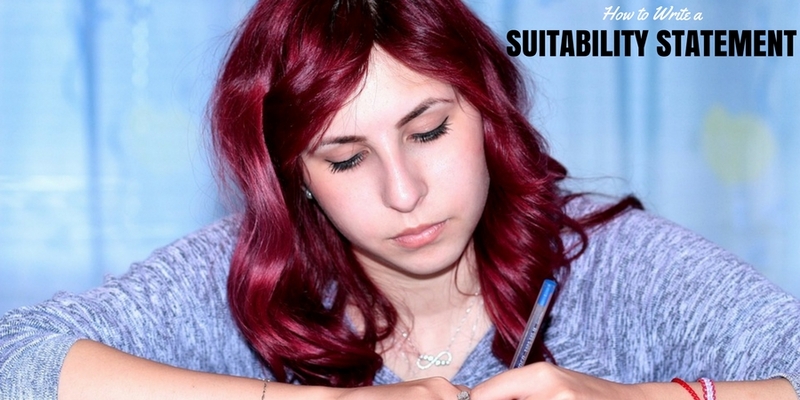 Suitability statements are one most important aspect of a job application since it highlights your characteristics and qualities that make you stand out of the crowd. It defines the suitability for the job. They also provide a detailed insight of your skills and qualities to your employer which keeps him assured about why they should reject others and consider your candidature. A suitability statement may also contain a brief knowledge about the concern which would show your awareness about the company that you are applying for. Suitability statement also showcases the researching ability and tendency to conduct the in-depth study by the candidate which attracts the employer towards you. Writing a personal statement has many phases, and the most important and tough one is the starting part. Though you can find several articles or sources online which help you on how to write a personal statement, what to include etc, but the main issue arises when you are about to write the beginning part. Your beginning part surely has to be effective and unique as it is the first thing to be read. So the best advice which we provide you is to “not to start at the start”. Before writing your introduction, prepare a draft of what you are planning to write. To make your opening a little catchy, it is better to first complete the whole part and then fine tune your draft for completing the starting part. Here are a few tips that you need to follow when beginning to write a personal statement. What you write in your supporting statement is going to be highly noticed by the employer. This is the most crucial part of your application. This is because it is where the candidate demonstrates the evidence why he/she should be selected for the position vacant. Whenever you are applying for a job online it is a must to include the personal statement or suitability statement that sets you separated from the general lot. The few lines that could create miracles to a job application must be very carefully written with good research work and complete awareness. Here are some ways that could guide you in creating wonderful suitability statement that could impress your employer at a glance and they would be forced to meet you in the next round. Prior to writing about yourself, you must know about the job specifications and being sure that your qualification and experience is at par with what the position demands. In the next step, it is most necessary to research and know about the company and understand the company values, mission, and culture where you wish yourself to fit in. This information would make you confident to write a compelling and impressive opening statement that is most beneficial in creating the first impression. Your in-depth research about the company would also be helpful in framing a well-tailored opening statement that is matched with the objectives of the employer. In the case of some employers, you would get a set format where you have to fit in your statement but with others, you may frame your own. Whatever skills and experiences you possess, need to be clearly outlined in crystal clear language. You should clearly state about how these special qualities of yours could come to their benefits. Never forget to specify all your past experience details and the responsibilities handled. You must remember to create individual and distinct sentences for each and every achievement so that they are separately noticed. When you are applying for a sales position, a reference to a job experience where your idea or initiative have boosted the sales of a particular product or service in the company is sure to attract your employer. This will also force him to give you a chance to prove yourself through a face to face round of interview. When your aim is to write some impressive and persuasive suitability statement then dedicating a paragraph to your qualities and characteristics that will make you an indispensable part of the organization is very much necessary. You should also add your related field experience to that which would specify how this trait of your’s has helped the company in rising to heights. A brief mention of those achievements that have helped in building your confidence, personal qualities and creativity and leadership as well is also a great attention moulder. Through this paragraph, your aim would be to let your prospective employer recognize your potential and grant you as a key player who would not only exhibit self-confidence but will also help the company in enhancing its profitability. A very crisp yet useful paragraph on how your personal and professional skill sets could prove to be a perfect match for the mentioned profile advertised by the company. Instead of just mentioning them, you could specify the link between your past experience and the position you are applying for. Remember to make brevity the soul of wit. No employer is ready to read line after line about how an all-rounder you are. Else they would be interested to know how your specialized skills and abilities could bring potential changes in their favour. Writing and highlighting the relevant education and training and other professional expertise that would be best suited for the position would be highly beneficial in attracting the employer’s attention immensely. A must follow rule of thumb for writing an effective suitability statement is to confine the writing within 75-100 words max. Whenever you are writing a suitability statement for any specified job profile, you should always remember to highlight your achievements from academics as well as profession. One very effective way to make your suitability statement a memorable one is to particularize whatever past experience you have achieved from your previous professional engagements. This easily creates a long lasting impression on your employer very easily. Many are there who do lack professional distinction but are a great storehouse of intangible qualities that may be highly beneficial for the company. This trait needs to be highlighted in a different way. A great brainstorming is required in order to impress your prospective employer through such a point. Here find out a way to weave a story and relating your inner qualities in such a way that it would sound beneficial for the position and in extension to your employer as well. It would make a great difference if you can avoid several phrases and clichés that make the employer tired. These phrases are typical and capable enough to make you fail in your aim to impress and get disqualified easily. The employer is sitting just to find out the most matching candidate for the position. So if you make this your aim and pack your statement with showcasing the depth of your skills and knowledge, there only you create the difference as you point out clearly what special you would bring to the table that others lack. Moreover when you pack your opening statement with stuff that is original, then you should know that half of your job is done. When you exhibit your pride in whatever you have achieved rather than being too modest in expressing about you, your employer is sure to get bemused about you and would like to give you a second view. Positive adjectives and adverbs play a positive role in creating a good view about you naturally. When you have an opportunity to showcase your challenges that you have faced, then try to avoid ‘good’ very often and add how you have overcome them at the same time mentioning what you have learned from such experiences. Don’t finish your suitability statement abruptly. At the conclusion, you should summarize some of your key skills. In the end, you can point out some of the qualities that are truly exceptional and makes you stand out of the crowd very easily. This would give your statement extra mileage and force your employer to think about you once again. The first and foremost purpose that a suitability statement or a professional statement solves for you is that it gives you an opportunity to place your credibility for a particular course or a job in writing. Your course or job might be paid or voluntary and the personal statements may be self-structured or in a set format by the company. The main aim of your suitability statement is to influence and persuade the employer and make him sure that you are going to be the best choice for the position offered. In this midst, it is not advisable to enlist each and every qualification or experience that you possess and stuff your statement with unnecessary things but you should create a paragraph highlighting your best of achievements that could be beneficial for the company. Here are some examples of suitability statements framed for different purposes that could prove handy for you in creating an effective and persuasive statement overall. Dealing with unemployment is never easy. But if this phase is dealt in the right way it is never hard even to get through the phase. A suitability statement written in a below-mentioned manner works great in impressing your prospective employer even if you are not in any role currently. A Highly motivated Retail Manager with more than 5 years of experience in the fashion industry with an established track record of accomplishments, including top-level management of a well-performing store in the area with the lowest staff turnover rate. At present out of job due to a company close down, now looking for the exact chance to utilize my expertise to an ingrained fashion brand in a higher management level. When some other priorities come to your life, you have to sometimes take tough decisions in your job life. But a come-back after a break becomes always smoother and appreciable when you write some suitability statement as mentioned here. A highly motivated PA with 5 years of proven experience in the industry. At present looking to recommence the professional journey after dedicating five years to the heaving of a family. Tremendous admin skills, methodical knowledge of all Microsoft Office programs, as well as expertise in minute-taking and extensive experience in connecting with clients. Sometimes in your career, you may need a shift to any other domain or position. A smooth and easy shift may be achieved if you know the right way to handle it. Suitability statement like this one is drafted especially for those who are looking for a career shift. Being an experienced sales professional, my obstinate and upbeat have resulted in a number of heavyweight projects win. My outstanding networking ability helped my team with very important client leads and my propensity to develop good client relationships have resulted in a considerable rise in the company sales as well as business renewals in my present organization. After a long and challenging career in sales, currently looking for a new challenge where my friendly professional manner can be utilized in result oriented projects. Drafting your suitability statement for the first time is not an easy task. So take your time well before you draft one and use these examples and guidelines to enhance your skill of writing one. And remember to edit your statement every time according to the role you are applying for.